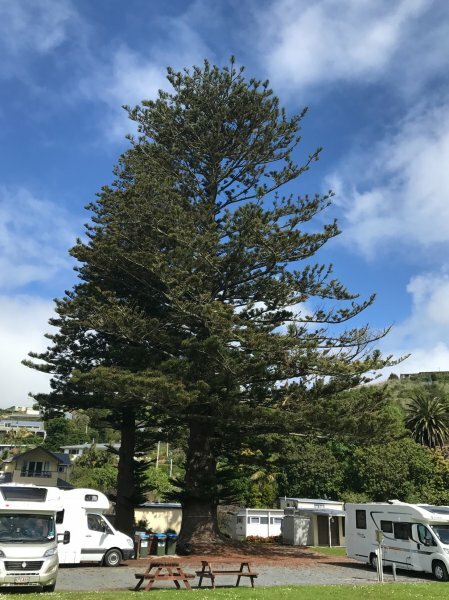 Norfolk Island Pine growing in Pahi Reserve. One of two growing approximately 100m north of the the Notable Fig tree NR/0501, which is growing within the same reserve. The tree in question is the easternmost tree. The two trees are growing 10 meters apart. The western Norfolk Island Pine is smaller in girth and volume. The two trees are registered as notable within the Kaipara District Plan ref. No.T7, Map 19,46 with a STEM ranking (given to the two trees by Council) of 198). There have been a number of failures within this tree at the time of assessment, including a column of branches failing on the tree's northwestern aspect. Slightly asymmetrical - a branch failures and branch reductions over the existing playground have affect the trees form. 03 Oct 2017 Redfern, J. R.